Duo Calm’s carefully balanced formula promotes healthy sleep by regulating your circadian (day/night) rhythm. Several vital tasks carried out during sleep help you stay healthy and function optimally. While asleep, your brain is forming the pathways necessary for learning, the creation of new insights and to consolidate memories. During this time, your body also undertakes essential tissue repair. Without adequate sleep, you can lose focus and may even experience fluctuating mood swings. Chronic lack of sleep can increase the risk of obesity, diabetes, cardiovascular disease and infections. Valerian’s calming properties de-stress the body, while Chamomile shortens sleep onset. Magnesium and Vitamin B6 contribute to physical and mental relaxation, supporting a deeper, improved quality of sleep (with beneficial REM brain activity). This allows the body to renew and restore its equilibrium optimally. Awake refreshed each day, with Duo Calm. Category D Medicine. Combination Western Herbal. Valerian is a natural sedative. Research shows that Valerian reduces sleep latency (the time taken to fall asleep), and also improves the quality of sleep. Chamomile has anti-spasmodic and sedative properties. The mineral Magnesium is responsible for muscle relaxation. Vitamin B6 works with Magnesium to promote muscle relaxation. This product is indicated when a deficiency of the active ingredients exists. If you suffer from a chronic medical condition use this product under the supervision of your healthcare practitioner. If you are taking chronic prescription medication for any anxiety or depression, consult your healthcare practitioner before using this product. Discontinue use of this product 2 weeks prior to any planned surgical procedure. Pregnant and breastfeeding women should avoid using this product. Take 1 capsule daily 30 minutes before bedtime. Discontinue the use of this product where there is sensitivity towards any of the ingredients. Avoid using this product if you operate heavy machinery or drive long distances. Do not consume together with alcohol. Size 0 capsule with light brown powder. Glass bottle with 30 capsules. Store at or below 25º C. Protect from light and moisture. Keep out of reach of children. Valerian is a natural sedative. It offers important health benefits that range from treatment of anxiety to cures for insomnia. Research shows that Valerian, a potent but safe sleep aid reduces sleep latency (the time it takes to fall asleep). It also improves the quality of sleep. Valerian is also used for anxiety and psychological stress as it reduces blood pressure, heart rate and feelings of pressure when under tension. Chamomile is caffeine free and a gentle relaxing and sleep aid. Due to its anti-spasmodic properties it is a muscle relaxant. Because of its calming and sedative properties, it also induces sleep. This is attributed to an antioxidant it contains called, Apigenin. This antioxidant binds to benzodiazepine receptors in the brain which reduces irritability, decreases anxiety and treats insomnia. Chrysin the phytochemicals also in chamomile, binds to GABA receptors. This reduces brain activity and produces a calming effect in the central nervous system. Chamomile can decrease symptoms of mild to moderate generalized anxiety disorder and thwarts panic attacks. In summary, Chamomile causes has three main effects on the central nervous system. The active phytochemicals in chamomile affect the neurotransmitters in the brain. Monoamine transmitters such as serotonin and dopamine are associated with sleep and mood. Chamomile has a positive effect on these transmitters. This results in improved sleep, enhanced mood, and relief of depression. Gaba (gamma aminobutyric acid) is a major inhibitory neurotransmitters in our central nervous system. The overall function of GABA is to inhibit transmission in the brain, calming the nervous activity. Chrysin the phytochemicals in chamomile also bind with the GABA receptors. This helps reduce brain activity, promotes calmness and results in an overall calming effect on the central nervous system to induces sleep. Chamomile assists the neurohormones including Melatonin which is responsible for inducing sleep and regulating sleep-wake cycle. The body requires large amounts of magnesium. This mineral is therefore known as a macro-mineral. It has wide-ranging effects in the body and used in over 600 cellular actions in the body. These include muscle relaxation and influencing certain processes that promote sleep. Magnesium deficiency is common. A deficiency of this vital mineral can cause tightness of muscles, increased stress, reduced serotonin levels and even sleep complications. It is essential as a muscle relaxation mineral and a key element in the production of the feel-good chemical serotonin. Magnesium glycinate also binds with GABA and that leads to anti-anxiety effects. It is therefore used to treat mild depression and stress by improving mood and encouraging healthy sleep habits. Vitamin B6 promotes proper function of the nervous system. Deficiencies in Vitamin B6 contribute to the chemical imbalances related to depression. With vital roles in the production of dopamine and serotonin, Vitamin B is essential to reduce irritability and depression. Vitamin B6 coacts with magnesium to promote muscle relaxation. It is specifically recommended at bedtime to help improve sleep. Volunteers were given an aqueous extract of valerian. Compared with the placebo, the valerian extract resulted in a statistically significant subjective improvement in time required to fall asleep (more or less difficult than usual), sleep quality (better or worse than usual), and number of night-time awakenings (more or less than usual). Eight volunteers with mild insomnia (usually had problems falling asleep) were evaluated for the effect of valerian on sleep latency (defined as the first 5-minute period without movement). Results were based on night-time motion measured by activity meters worn on the wrist and on responses to questionnaires about sleep quality, latency, depth and morning sleepiness. The test samples were 450mg or 900 mg of an aqueous valerian extract and a placebo. The 450mg test sample of valerian extract reduced average sleep latency from about 16 to 9 minutes, which is similar to the activity of prescription benzodiazepine medication (used as a sedative or tranquilizer). No statistically significant shortening of sleep latency was seen with the 900-mg test sample. Evaluation of the questionnaires showed a statistically significant improvement in subjectively measured sleep. The 900-mg test sample increased the sleep improvement but participants noted an increase in sleepiness the next morning. Longer-term effects in 121 participants with documented nonorganic insomnia. Participants received either 600 mg of a standardized commercial preparation of dried valerian root or placebo for 28 days. Several assessment tools were used to evaluate the effectiveness and tolerance of the interventions, including questionnaires on therapeutic effect (given on days 14 and 28), change in sleep patterns (given on day 28), and changes in sleep quality and well-being (given on days 0, 14, and 28). After 28 days, the group receiving the valerian extract showed a decrease in insomnia symptoms on all the assessment tools compared with the placebo group. The differences in improvement between valerian and placebo increased between the assessments done on days 14 and 28. In a randomized, double-blind study, 75 participants with documented nonorganic insomnia were randomly assigned to receive 600 mg of a standardized commercial valerian extract or 10mg oxazepam (a benzodiazepine medication) for 28 days. Assessment tools used to evaluate the effectiveness and tolerance of the interventions included validated sleep, mood scale, and anxiety questionnaires as well as sleep rating by a physician (on days 0, 14, and 28). Treatment result was determined via a 4-step rating scale at the end of the study (day 28). Both groups had the same improvement in sleep quality, but the valerian group reported fewer side effects than did the oxazepam group. Researchers evaluated sleep parameters with polysomnographic techniques that monitored sleep stages, sleep latency, and total sleep time to objectively measure sleep quality and stages. Questionnaires were used for subjective measurement of sleep parameters. Sixteen participants with medically documented nonorganic insomnia were randomly assigned to receive either a single dose and a 14-day administration of 600mg of a standardized commercial preparation of valerian or placebo. During slow-wave sleep, arousability, skeletal muscle tone, heart rate, blood pressure, and respiratory frequency decreased. Increased time spent in slow-wave sleep may decrease insomnia symptoms. The valerian group reported fewer adverse events than did the placebo group. How does Duo Calm work? Will Duo Calm help me fall sleep? Valerian, a potent but safe sleep aid. It reduces sleep latency. Chamomile because of its calming and sedative properties also promotes sleep. Will Duo Calm induce morning drowsiness? There is no evidence of residual or “hangover” effects. Duo calm promotes a natural and refreshing sleep. Can I take it when I am anxious? Duo Calm supports well-being and balance during times of stress. Will Duo Calm help me calm down? It is a relief from pressure often caused by the stresses and strains of modern living. Valerian is also useful for times of anxiety and psychological stress as it reduces blood pressure, heart rate, and feelings of pressure when under tension. Magnesium and Vitamin B6 are essentially important during these periods, as it supports the healthy functioning of the nervous system. The product in itself is not habit-forming. As with all sleep medicines they have the potential for causing dependence. In the large majority of cases with Schedule 0 Nutritional Substances, this is usually psychological, not physical. Duo Calm is however best used as a temporary relief of sleep or stress disturbances. Duo Calm should not be taken by anyone under the age of 18. Can I take it during the day to boost my mood or will it put me to sleep? It is preferable not to use Duo Calm during the day unless to promote calmness or induce sleep; and only if an individual is not undertaking serious physical or mental activity. Avoid using the product if you operate heavy machinery or drive long distances. To note, most often sleeping during the day is not part of a person’s natural circadian rhythm. *Depending on the requirement of rest needed during the day, short 15-20 minute naps are also great options. Can I use Duo Calm to regulate PMS mood? Symptoms of PMS are related to hormonal imbalances. Ingredients in Duo Calm do not have an effect on hormones. Duo Calm however will provide symptomatic relief from anxiety or tension experienced. Can I use Duo Calm daily? The ingredients in Duo Calm are not habit forming. The product can be used continuously for extended periods of time. What is the maximum number of Duo Calm capsules I can use each day? How long before the onset of sleep? Does Duo Calm have clinical research backing to support its claims? Duo Calm is supported by a team of clinical researchers and doctors. It is authenticated by clinical evidence and each of its ingredients has proven health benefits. All products developed by Fusion Laboratories conform to the stringent input, processing and quality control criteria of the legislative authorities within the countries in which they are marketed. Is Duo Calm safe and are there any side effects? Duo Calm is completely safe and does not have any known side effects. It has a well-established safety profile. Fusion Laboratories manufactures the product under the Good Manufacturing Practices (GMP) standards in a fully controlled facility. This ensures purity, stability of its ingredients and accuracy of the final product. If, for any reason, Duo Calm does not meet stringent pharmaceutical standards, the product is not approved for release from our facility. How does a general sleeping tablet work? Why choose Duo Calm over other sleep supplements? 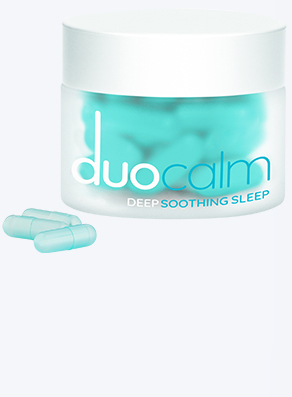 Duo Calm induces both sleep and promotes a feeling of calmness. Fusion Laboratories sources the highest quality ingredients and uses the most advanced technology and research to develop its products. Duo Calm has superior product formulation. Its smart and balanced formula is specially designed to allow for optimal absorption, efficacy and enhanced sleep. None of the ingredients have been tested on animals. We do not use artificial flavourants or preservatives. “We actually ordered the 6 units of Duo Calm to try ourselves before stocking it in the salon – we believe in trying products first so that we can properly endorse them when retailing to our customers. We are happy with the product. Besides good results, I love the colour of the capsules – a very calming blue! Refer to research for more information regarding efficacy.